We know it can sometimes be daunting to raise a complaint but we will never be offended if you do so. Your case or transaction will not be prejudiced by you raising concerns either. We hope you will not have any reason to complain, but in case you do, you should follow the procedure below. The time limits for bringing a complaint to our attention are set out in our Terms and Conditions of Business, namely within six months of the end of the matter on which you instructed us, or within three months of you becoming aware of the circumstances giving rise to your complaint, whichever is the later. In the first instance, please raise your concerns directly with the person dealing with your case or transaction by email, post or over the phone. If you feel that it is too delicate for you to raise this directly with them, or they have not addressed all your concerns to your satisfaction, you should raise your concerns with their manager. Their manager’s name will be mentioned in our engagement letter to you, sent at the beginning of your case or transaction. Alternatively, you may simply ask your lawyer for their manager’s name or just ring us to request that information. If neither your lawyer nor their manager can resolve your concerns to your satisfaction, your complaint will reach the second stage. 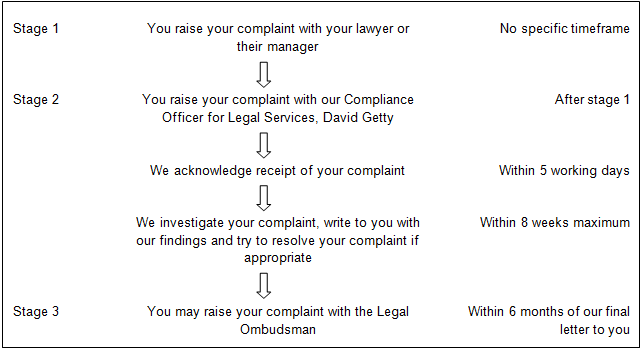 You may progress your complaint to our Compliance Officer for Legal Practice and Managing Partner, David Getty. When you do so, please set out as much detail as possible regarding your complaint. You may find the template letter on the Legal Ombudsman’s website useful (www.legalombudsman.org.uk/). We will acknowledge receipt of your complaint within five working days. We will tell you how long it will take us to investigate your complaint. This normally is around three or four weeks but it could be less or more (either due to the circumstances of your complaint, illness or holidays). In any event it should never be more than eight weeks after acknowledging receipt of your complaint. We will review your file and if necessary talk to the person dealing with your case, their manager, or a Partner in the firm who specialises in the relevant area of law. We will send you the result of our investigation by email or post, depending on how you contacted us in the first place or any preference you may have. We may also offer to meet with you to discuss your complaint and resolve it. If we agree with you and we find the service you received was not as we would have like it to be, we will work with you to try to find a way to resolve your complaint. If we find that your complaint does not support a finding of poor service we will let you know the reasons why. We will let you know what to do if you are unhappy with our decision: we will tell you whether we agree to using Alternative Dispute Resolution, or whether your complaint can proceed to Stage 3. Gaby Hardwicke Solicitors is authorised and regulated by the Solicitors Regulation Authority, The Cube, 199 Wharfside Street, Birmingham, B1 1RN (the SRA). This means that we are governed by a Code of Conduct and other professional rules, which you can access on the SRA’s website (www.sra.org.uk) or by calling 0370 606 2555. Our SRA registration number is 173901. If you believe that we have behaved dishonestly, illegally or in breach of the SRA’s principles, you can complain to the SRA using the details provided above.